Frequently-Asked Questions contains answers to most of the common questions clinicians and administrators ask about Concussion Vital Signs. What do I do if I forget my Administrator Password? What do I do if I forget my Athlete Testing Password? What do I do if I forget my Administrator User Name? What do I do if I forget my Athlete Testing User Name? What is the difference between an Administrator Login account and an Athlete Testing account? I am locked out of my account for attempting too many log-ins. What happens next? What is the Administrator Login button on the Concussion Vital Signs Homepage? What is the Athlete Testing Login on the Concussion Vital Signs Homepage? How do I register if I support multiple schools? What computer issues should I be aware of? What bandwidth issues should I be aware of? Can I use a tablet e.g., iPad or Droid to view testing results? How do I use Concussion Vital Signs? What age ranges can be tested with Concussion Vital Signs? Do you have a description of the tests? How do I switch from my current testing battery to Concussion Vital Signs? What equipment will my athletes need to use Concussion Vital Signs? Can neurocognitive testing be administered on a tablet? Who can administer Concussion Vital Signs? How is baseline testing best achieved with teams? When should a student athlete be re-tested? What steps should be taken before retesting an athlete that has produced invalid scores on prior tests? What information does the Compared to Peers column provide? What does the VALID SCORE mean on the test report? Do you have an interpretation guide? Why does my athlete have invalid scores (A NO in the validity score section of report)? Can I refer or share testing report results with the athlete"s doctor for further evaluation and management if needed? As a healthcare provider, can I bill for Concussion Vital Signs? Why should our team do neurocognitive sports concussion testing? Why is Concussion Vital Signs appropriate as part of our concussion management protocol? How can Concussion Vital Signs Integrate into my Concussion Management policy and plan? Who is CNS Vital Signs? Click the "Forgot Password" button at the bottom of the homepage and submit your email address and a new password will be generated and emailed to you at the registered email account. You will need to contact the Administrator of the account, typically the person that registered for the account and get them to reset or change the password. The Administrator User Name is the email address you registered with. If you do not remember it, go to the Pricing Info page for information regarding recovering an Administrator Login. An Administrative account, can see and print tests, and generate users as well as manage Athlete Testing User Names and Passwords, but NOT test. An Athlete Testing account can only test. Do not share your Administrator account with anyone. Yes, you are allowed 5 login attempts and if you fail, then an email is automatically sent to the Administrator login account. The Administrator Login allows the administrator to view an athlete's testing results and manage the account. The Athlete Testing Login allows athlete to take an assessment. The proctor will need to provide the Athlete Testing Login to the athletes or have the computer queued up ready for testing. Each unique school should have a unique account. You can have, and we suggest, the same Primary Contact for multiple schools if you will be overseeing them all, but each school will have to have a unique administrator log in. You will assign the Primary Contact and Administrator login as well as one Athlete Testing login when you register. So in summary, when you register, each school will have to have a unique registration with a unique administrator log in, but you can use the Primary Contact across any number of schools. Concussion Vital Signs platform works on most any current web browser. If you are having problems with the browser, consider downloading and testing with an alternative browser, such as Firefox. To optimize the testing performance on the computer system, while running Concussion Vital Signs, it is recommended that: No other applications be in operation during testing. No running of any background system services. The system be free of viruses and pop-ups e.g. ad-ware, spy-ware, etc. No virus scanning, ad-ware scanning, or spy software scanning software should be actively scanning during subject testing. The window screen saver option should not be active during subject testing. Power management functions should be disabled (laptop). "Windows Update" functionality should be set during times testing would be unlikely. If testing in a school Computer Lab, contact the Computer Lab System Administrator and ask them to make sure that the Concussion Vital Signs website be assessable. The testing facility must have a reliable, broadband network connection to accommodate the numbers of athletes being tested at one time. In advance of testing, those administering the test should be certain the network will allow access to the website www.concussionvitalsigns.com as well as take a test. If the test drags or skips tests you will need to reduce the number of athletes being tested or have the technical staff investigate the local network and its connectivity to the internet. Yes, reports can be viewed with a tablet device. Only schools in the United States can sign up. Visit www.concussionvitalsigns.com. Locate the REGISTER button on the right side of the website homepage. During the registration, you will set-up and "Athlete Testing Login" and an "Account Administrator Login" (view reports and manage the account). After registration you will be sent an activation email, click the activation link in the email to "Activate Your Account". In addition you will get another email with helpful information about your account. We encourage you to print or save the email for later reference. You can now begin testing using your "Athlete Testing Login". Again, you should save your Administrative usernames and passwords information in a secure location and not share with anyone. You can also view the "How To Begin" guide as a PDF in the margin to the right. Concussion Vital Signs is an intuitive concussion assessment platform. It can be used in most any concussion management protocol where a neurocognitive test is part of the protocol. Check with your professional society (NCAA, NATA, AAN etc.) for assistance in developing a concussion management protocol. 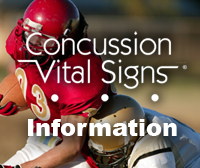 Please refer to the Concussion Vital Signs website for documents and hyperlinks which you may find helpful. The Test Info and Reports links on the home page give overviews of the test itself as well as the report. Also check the PDFs in the right margin regarding any topic of interest. Depending on the athlete and the environment, testing takes between 25 and 35 minutes typically. 10 to 25 years of age. Yes, you can find the test descriptions within the Interpretation Guide as a PDF in the margin to the right. Clients have used two conversion approaches: Immediate Conversion - Re-baseline everyone with Concussion Vital Signs. No need to worry about how many baseline or post-injury testing sessions they will use given the free testing offer. Gradual Conversion- Continue to use existing system for previous baselines collected while converting incoming athletes to Concussion Vital Signs. Either approach can be used to convert to an easy-to-use, cost effective assessment platform like Concussion Vital Signs. Testing can be done on any laptop or desktop computer that has a browser and persistent internet connection. We encourage you to use a separate external keyboard if using a laptop as testing keyboards tend to wear out and the external ones are easier to replace than a laptop keyboard. Tablets, mobile devices or wireless keyboards are not appropriate for neurocognitive testing. No, neurocognitive testing may only be administered on a computer. The athlete testing sessions can be proctored by you or your training staff. Proctors will need an Athlete Testing login. Baseline testing is best completed individually or in small groups, e.g. as part of an annual physical, clinician or technician supervision (preferred) or if a larger group must be tested, group testing in the schools computer lab e.g. with proctored supervision. You should consider re-testing whenever an invalid score appears, as well as each year if your protocol supports annual baseline testing. You should also consider re-testing if it is obvious to you that the athlete did not put forth an appropriate effort. Before Retesting, the test examiner or technician should reinforce the need for the subject to give a good testing effort and use the "Validity Score" as a tool to help with the reinforcement. The proctor should also make sure the athlete understands the directions for each test. The Compared to Peers scores are not intended and should not be used to make any sort of return to play decisions. Those values simply provide a general idea of where the athlete"s score compared to their peers. There are three possible groups in the Compared to Peers column, Below Average, Average and Above Average. Athletes scoring Above Average are scoring greater than one standard deviation higher than their student peers. Athletes scoring Below Average are scoring less than one standard deviation lower than their student peers. Average scoring fall between Above Average and Below Average. About 2/3 of students peers will score Average. These groups are strictly defined by accepted psychometric statistics. Those scoring Below average have a Percentile Rank of less than 16. Similarly, those scoring Above have a Percentile Rank of greater than 84. Note that Concussion Vital Signs is a subset of the clinical battery CNS Vital Signs and as such may identify athletes with a cognitive deficit. Athletes with extremely low scores that cannot improve upon retest may need to see a qualified healthcare provider for a more comprehensive workup. If you are a clinician and are interested in testing for other than concussion management, please visit www.cnsvs.com for more information on our medical battery. Concussion Vital Signs testing alone in not evidence for returning to play. Clinicians should perform a comprehensive exam as needed. It is important to understand and for clinicians to be aware that athletes who do not do their best on the baseline test may score higher on a post injury test and this can be a spurious result. It is important to understand and for clinicians to be aware that athletes who do not put forth their best on the baseline test may actually core higher on a post injury test and this could be a spurious result. If an athlete does not achieve YES in the Valid Score sections of the report, you should consider retesting the athlete. The Validity Score alerts the clinician to the possibility of an invalid test allowing the clinician, examiner or testing technician to question the testing subject: Do the testing results reflect an understanding of the test and the instructions? Did the testing subject put forth their best effort? Did they get a good night"s sleep? Does the subject have poor vision and need their glasses? Do the results suggest willful exaggeration, e.g., sandbagging? Yes, you can find the Interpretation Guide as a PDF in the margin to the right. Testing results on all neuropsychological tests (computerized and paper pencil) like Concussion Vital Signs can be scored as invalid if the testing subject does not put forth their best effort during the testing process. Testing subjects can also misunderstand or not read the instructions and score abnormally low on a particular test. The test proctor should reinforce the need for the athlete to give a good testing effort and use the valid (embedded indicators of effort) as a tool to help with the reinforcement. The Validity Score alerts the clinician to the possibility of an invalid test allowing the clinician, examiner or testing technician to question the testing subject: Do the testing results reflect an understanding of the test and the instructions? Did the testing subject put forth their best effort? Did they get a good night"s sleep? Does the subject have poor vision and need their glasses? Do the results suggest willful exaggeration, e.g., sandbagging? Before Retesting, the test examiner or technician should reinforce the need for the subject to give a good testing effort and use the "Validity Score" as a tool to help with the reinforcement. Upon retest, should a subject test abnormally low again triggering yet another "invalid" test (NO as displayed in the Validity Score section of the report) and the clinician believes it was the patient"s best effort further evaluation or referrals should be considered e.g., reading skills and ability. Yes, the system is designed such that you can share information as well as have a qualified healthcare provider administer tests on the school account. It"s best to send the most recent Concussion Vital Signs report with the athlete. If you don"t have the most recent then the athlete can take any report and the clinician will have access to the most recent report and be able to administer a post injury test. When clinicians use the Clinician Portal, the athlete can take a post-injury assessment from any qualified clinician. It allows the athlete and their family to obtain free external in-clinic testing and view the athletes most current testing results with their family"s chosen qualified health professional e.g., health plan in-network doctor. The clinicians will need to register at the Clinician Portal and then enter an athlete"s "Athlete Reference/ID" and "Concussion Reference Code" found at the top of the athletes testing report. After registering the doctor will be able to view the athletes current testing results and administer a post-injury test in his/her office. Yes you can find the Billing and Coding PDF in the margin to the right. Concussions can happen to any athlete of any age, male or female, in any sport. While such injuries may not always be preventable, clinicians and athletic trainers are able to use valid and reliable tools to recognize and treat concussions to make sure athletes are fully recovered. Concussion Vital Signs provides neurocognitive baseline and post injury testing that are frequently suggested as a part of a comprehensive concussion management protocol. Concussion Vital Signs helps clinicians collect objective evaluation and management endpoints. Concussion Vital Signs testing alone in not evidence for returning to play. Clinicians should perform a comprehensive exam as needed. It is important to understand and for clinicians to be aware that athletes who do not do their best on the baseline test may score higher on a post injury test and this can be a spurious result. Concussion Vital Signs provides a brief, web based neurocognitive testing solution (baseline and post-concussion), as well as a self‐reported history, and post‐concussion symptom rating scales. Neurocognitive evaluations along with medical history as well as balance testing etc, may assist qualified health professionals in collecting important information used in evaluating, monitoring, and managing concussions. Concussion Vital Signs is designed to give the athletic trainer and sports medicine staff maximum ease-of-use, assessment flexibility, and system reliability. Concussion Vital Signs is practical and scientifically robust. Concussion Vital Signs is economical, is noted for being relatively easy and quick to administer. Check with your professional society (NCAA, NATA, AAN etc) for assistance in developing or integrating a concussion management protocol. As an example: on the Resource page review the UNC - Chapel Hill Sports Concussion Policy PDF; Developed by the Matthew Gfeller Sport-Related Traumatic Brain Injury Research Center and Division of Sports Medicine Updated August 1, 2010. Concussion Vital Signs provides a modular or flexible set of concussion management tools . Concussion Vital Signs is a product of CNS Vital Signs, a world leader in the design and development of standardized neurocognitive assessment tools. As a clinical instrument, the CNS Vital Signs medical neurocognitive battery has been used to evaluate and manage patients by more than 9000 clinicians and researchers in 52 countries. Concussion Vital Signs is focused on concussion testing and uses a subset of the CNS Vital Signs medical tests. Visit the Publications link to review scientific literature for CNS Vital Signs.